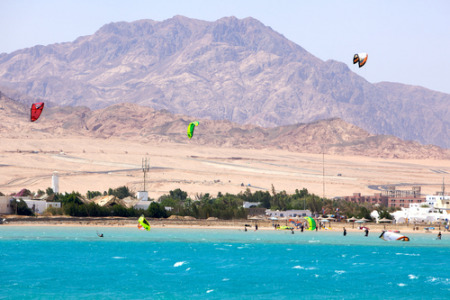 Dahab holidays have wide appeal. Located in Egypt, fifty miles north of Sharm el Sheikh, the resort has much to offer. The original village has spread around a bay on the Sinai Peninsula and is surrounded by an undulating desert framed by mountains. With soft sun-bleached sands and warm, crystal clear water, Dahab holidays attract large numbers of families as well as couples of all ages. A constant breeze across the bay, which is very welcome in the height of summer, gives perfect conditions for wind surfing. The clarity of the water, the fertile marine life and the coral reef also attract divers, as does the famous Blue Hole where the sea plunges to a great depth. Dahab accommodation offers first class luxury, and the quality of the service is excellent. Don't dimiss the all-inclusive option as being too expensive as there are bargains to be found. This option helps to keep your Dahab holiday within budget, especially for those with ever hungry and thirsty children. Constant snacks and drinks can leave a sizeable hole in your pocket. A large number of restaurants cater for even the most fussy of eaters. It is important to remember to drink bottled water as tummy upsets can ruin a holiday. Dahab's bazaar is popular with tourists looking for souvenirs and gifts. Never pay the marked price as this is merely the starting point for negotiations and haggling over the cost is expected. With low cost flights to Tabor International operating from a number of regional airports, travel there has never been cheaper. Dahab holidays can be taken at any time of year although the height of summer sees temperatures rising to forty degrees. The most popular time to visit is early in the year when temperatures are more comfortable. It is a good destination for those seeking a break from the winter blues. Although many visitors are looking for total relaxation, there are plenty of recreational facilities and tourist attractions in the area. A popular excursion is a trip to the impressive Coloured Canyon, a sight you won't forget. Search holidays to Dahab today. If you fancy a Dahab holiday, but find the task of scouring the internet for the cheapest option a little daunting, use our simple search facility that will quickly find you the Dahab holiday that gives you the best deal. As a price comparison site we bring you offers from over thirty travel companies, including some of the market leaders, who are all competing for your custom. This competition inevitably leads to great bargain holidays. As the very best offers change daily, don't delay, ring and book today. Check out our Dahab holidays 2014. You'll also find the cheapest school holiday deals.